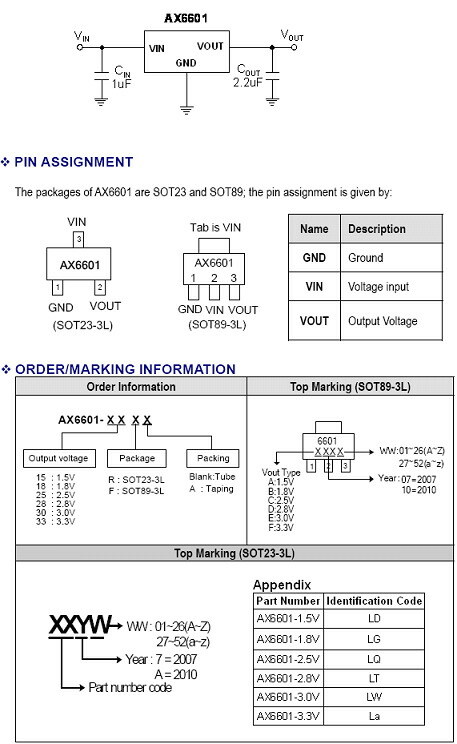 The AX6601 is a 300mA, fixed output voltage, low dropout linear regulator. The Device includes pass element, error amplifier, band-gap, current-limit, and thermal shutdown circuitry. The characteristics of low dropout voltage and less quiescent current make it good for some critical current application, for example, some battery powered devices. The typical quiescent current is approximately 90μA. Due to internal flexible design, result in extensively fixed output voltage versions and make it convenient to use for applications. Built-in current-limit, short-circuit protection and thermal-shutdown functions prevent any fault condition from IC damage. - Fixed Output voltage is 1.5V, 1.8V, 2.5V, 2.8V, 3.0V and 3.3V.